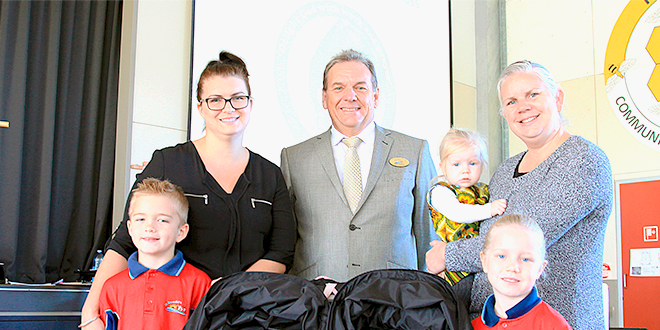 Decade: Foundation principal Mark Creevey celebrates with parents Kelly Pickering and Donna Ingham and their children. ST Benedict’s School, Mango Hill, had much to celebrate on its official feast day with a birthday party, a farewell and a welcome. The primary school opened its doors in 2008 to 108 students. Under the watchful eye of foundation principal Mark Creevey, it has grown in the past 10 years to about 650 students and 67 staff members. Mr Creevey, who is moving on to new challenges, said it had been a wonderful journey so far. “Today we celebrated in grand style our tenth anniversary on the feast day of St Benedict,” he said. “This special occasion was remembered through a range of activities all throughout the day. Mr Creevey said the students enjoyed a variety of activities that included blow-up slides, obstacle courses, carnival games, supervised by parents, and Hip Hop dancing in the hall, to name a few. Mr Creevey said the school was a vibrant educational community with a wonderful staff, great students and families. “Today we celebrated being blessed with the many valued and shared gifts of each person,” he said. “Both of our religious celebrations focused on the gifts that we bring to our community and our motto to ‘Walk in Gods Ways’. As the day-long celebrations concluded Mr Creevey welcomed new principal Patrick Davis to the school community. Mr Davis, who is no stranger to St Benedict’s, as he is a parent in the community, will move from being principal at Our Lady of Dolours School, Mitchelton, to his new role at the start next year.